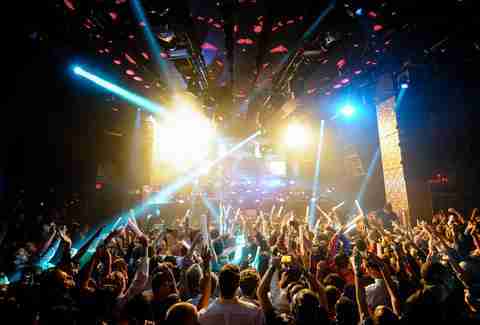 Las Vegas is dominated by nightclubs -- usually found in the lobby of every big resort on the Strip. Each one is a prime destination for being seen, hooking up, and paying way too much for a Jack and Coke. 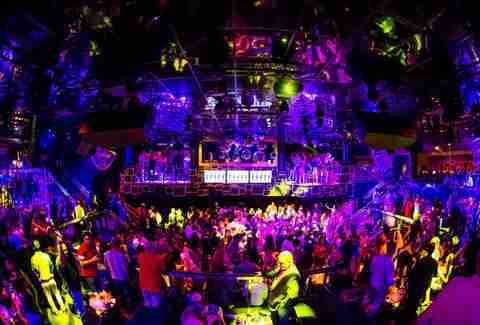 But they're also the best places to check out your favorite music and dance the night/morning away. So here's a little help for when you plan your next big night out and want to make sure that of all the things you have to deal with, not hearing your favorite tunes isn’t one of them. The music you'll be dancing to: It may depend on which part of the club you happen to be drinking your vodka cranberry in. 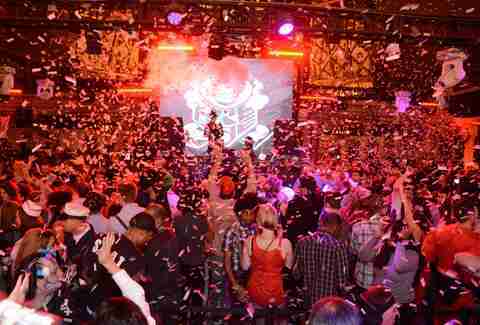 The main room specializes in electronic music with residencies by Calvin Harris and Kaskade. Other big names on the roster include Zedd and Afrojack. The smaller Heart of Omnia is open-format, while the outdoor terrace throws in some top 40 to round things out. Why you'll also want to party here: The aforementioned terrace is a long patio that offers some fresh air and a perfect mid-level view of the Strip. But you'll want to stick around indoors for a while to check out the massive fancy chandelier that hovers from the ceiling and moves to the music. The music you'll be dancing to: Lots of EDM with big name DJs like Major Lazer, Skrillex, and Diplo performing regularly. Why you'll also want to party here: An indulgent atmosphere, with real gold lining the walls and a crowded dance floor surrounded by VIP tables. Step outside for a little more breathing room and a pool that welcomes partiers during the weekly Sunday NightSwim events during the summer. The music you'll be dancing to: Open less than a year, Jewel has seen the likes of Drake, The Chainsmokers, Zedd, and Steve Aoki take to the stage. Lots of pop and lots of EDM. Why you'll also want to party here: A modern layout and design with LED lights and images that pulsate with the rhythm of the music. There are also five distinct VIP rooms. All have a great view overlooking the dance floor and each has been given a theme (like sports for "The G.O.A.T.," and vintage speakeasy for "The Blind Tiger"). The music you'll be dancing to: Lots of electronic, with big names like Tiësto and Steve Aoki doing regular shows. The smaller Ling Ling Club hosts open-format DJs each night, while the Ling Ling Lounge (keep 'em straight) is more on the mellow side but will still throw out some '90s and hip-hop. 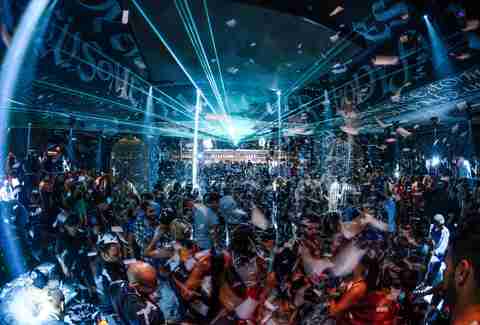 Why you'll also want to party here: Hakkasan is big, loud, and scattered over multiple levels, so be ready to hike up and down a few stairs. There's plenty of space in the main room, but the smaller Ling Ling Club one floor below is good for a less chaotic atmosphere. The Ling Ling Lounge is more suited for sipping drinks than dancing. The music you'll be dancing to: EDM and top 40. While there are plenty of celebrity guests for special events, you're more likely to come here for a wild party than famous DJs. Why you'll also want to party here: A number of different rooms keep things interesting, including a "library" and a fun circular dance floor. There's also a pool that stays open during the cold winter months thanks to a temporary dome that's built on top. The music you'll be dancing to: Open-format DJs and a diverse calendar that features live performances, hip-hop, and top 40 hits. 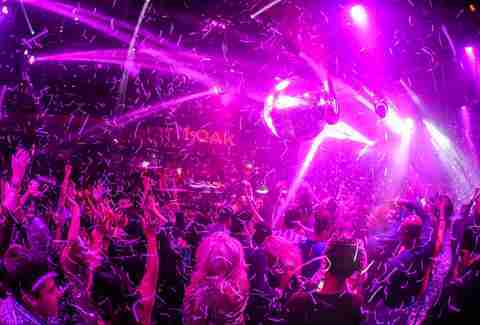 Why you'll also want to party here: While not quite as notorious as its LA counterpart, 1 OAK can be a good place for celebrity sightings. It's a favorite of the Kardashians and almost-Kardashians like Scott Disick and Blac Chyna. The music you'll be dancing to: Lots of EDM -- including dirty house from Chuckie and the radio hits of DJ Snake. 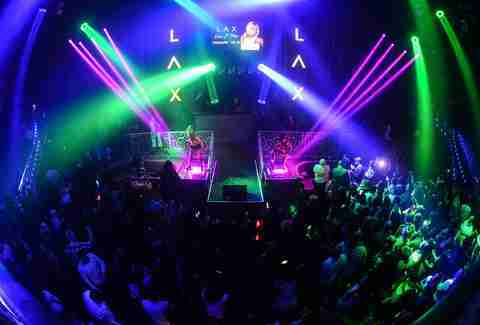 Why you'll also want to party here: The room in front of the DJ booth is relatively small and usually packed. It's the spacious pool area behind it that's the real draw at Surrender. There's plenty of room to get as close to (or as far away from) the pounding music as you like -- along with a few bars and even some gaming tables. The music you'll be dancing to: Tao seems to play more top 40 and pop hits than some of the other big clubs, but retains an open-format mentality that can mix things up and take you by surprise. Especially when you explore the different rooms (and DJs) scattered throughout the venue. On big nights you may see a DJ set by Snoop Dogg or live performances by rap acts like Ty Dolla $ign or Juicy J. 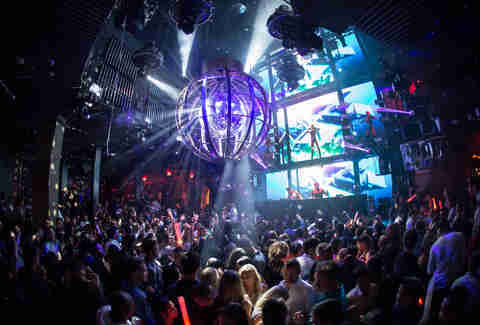 Why you'll also want to party here: With a pool upstairs and an Asian restaurant downstairs, Tao tends to stay busy and is one of the more versatile clubs on the Strip. Bathtubs filled with rose petals line the entranceway, and while the outdoor balcony could be just a little bit bigger, it still gives you a chance to escape the music and grab a breather while overlooking Las Vegas Blvd. The music you'll be dancing to: R&B -- and lots of it. 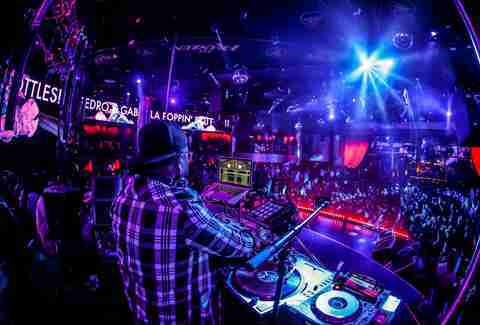 Drai's has seen Chris Brown and The Weeknd play residencies within the past year and hosted special appearances from Nicki Minaj, 2 Chainz, and Kendrick Lamar. In between the big acts, the DJs will mix things up with EDM and top 40 -- and just to be completely different, Drai's signed spoof hair metal band Steel Panther to a series of dates. Why you'll also want to party here: The most sweeping view of Las Vegas from any night club can be found here -- and it's not even close. One half of the club is indoors. The other half is out by the pool -- surrounded by towering palm trees and the neon marquees of the Strip. It's hard to find a better makeout spot. The music you'll be dancing to: It varies by night but usually a mix of top 40, EDM, and hip-hop. Name DJs can range from Lil Jon to reality TV star Brody Jenner. Why you'll also want to party here: The cozy club is a little short on space, so unless you have a table, things are going to be tight on the dance floor. But there's an awesome open-air view of the Bellagio fountains and regular XIV Vegas Sessions costume parties with themed outfits and Champagne showers. The club is more of a lounge earlier in the night and serves up half-price bottles of vino on Wine Wednesdays. 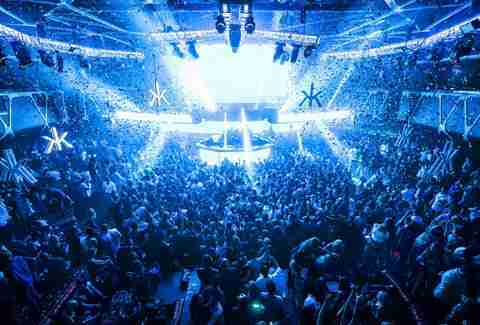 A sister Hyde nightclub can be found on the top level of the T-Mobile Arena, playing dance music after big events -- whether it's a UFC fight or a Bon Jovi concert. The music you'll be dancing to: Lil Wayne and Nick Jonas have performed here as special guests in recent months. 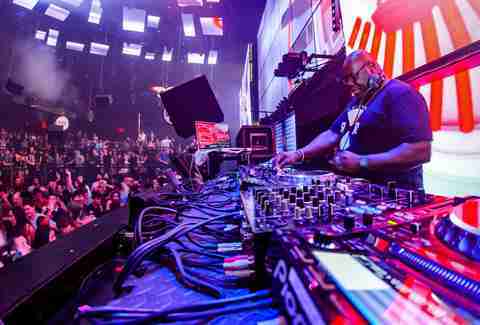 The club leans towards pop hits and top 40 but mixes in plenty of R&B and EDM from the regular DJs. Why you'll also want to party here: The giant birdcages with dancers inside are pretty cool, and one end of the club spills out onto the Foxtail pool area, allowing you to continue the party underneath the stars -- and underneath the windows of some possibly annoyed hotel guests at the SLS. The music you'll be dancing to: Throwback Thursdays features music from the '80s and '90s -- as well as guest performers and celebrity hosts like Mary J. Blige. You'll still get plenty of R&B on the other nights as well as electronic and top 40. Why you'll also want to party here: The club has been around a while, so it invested in some much-needed upgrades in 2016, including a new lighting and sound system -- as well as LED screens around the DJ booth. Hang around the lobby long enough and you'll usually see VIP hosts handing out passes. It's a great way to get the night started in Vegas without spending too much cash -- or waiting in a line that's too long. 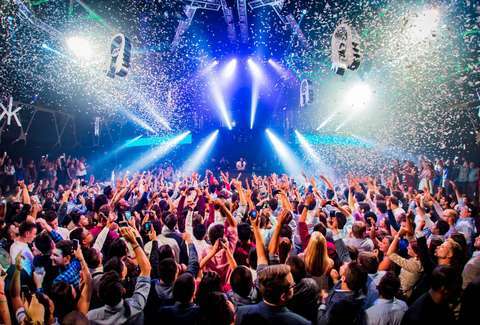 The music you'll be dancing to: Open less than a year, Intrigue lives up to its name with special guest performers that often show up announced (Kesha, Tinashe) and some who don't (Ne-Yo, Deadmau5). 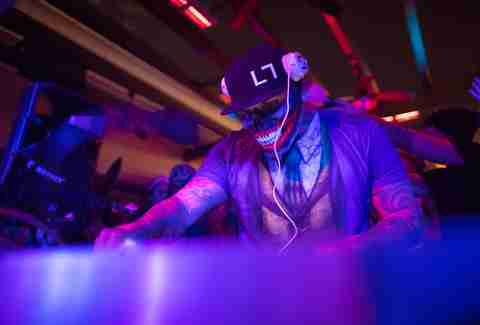 The idea is to keep you guessing, although regular DJs have included Diplo and Marshmello. 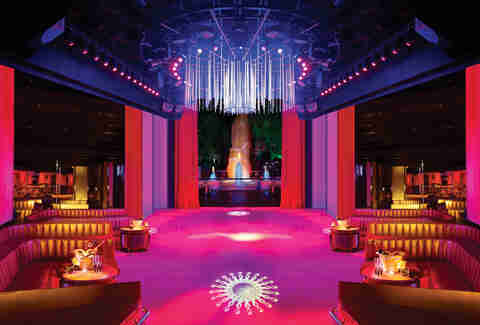 Why you'll also want to party here: The outdoor waterfall and pond make Intrigue one of the most beautiful clubs in Vegas, although it's a bit on the small side. Thirty-six movie projectors paint the venue with colors and patterns that change from one night to the next. The Living Room is a "club within a club" that feels like a cool retro apartment for VIPs. Make friends with the right person and check it out. The music you'll be dancing to: An open-format lineup of DJs that aren't the biggest names in the world, but will tend to mix in plenty of house and hip-hop. Why you'll also want to party here: If you find Hyde Bellagio is a little too busy, this under-the-radar club is a good alternative in the same resort. It doesn't get as much hype but offers some style and fun with a rectangular room flanked by stairs -- almost like you're dancing inside an M.C. Escher drawing. The Bank stays busy with the industry crowd on Sunday nights. The music you'll be dancing to: A mix of EDM, hip-hop, and whatever the regular performers come up with. 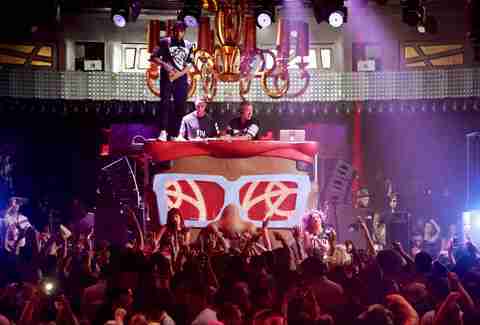 They include house favorites Disclosure and Morgan Page, as well as Baauer -- the guy responsible for the "Harlem Shake." You'll also see rap and R&B acts like Tyga and Nas. 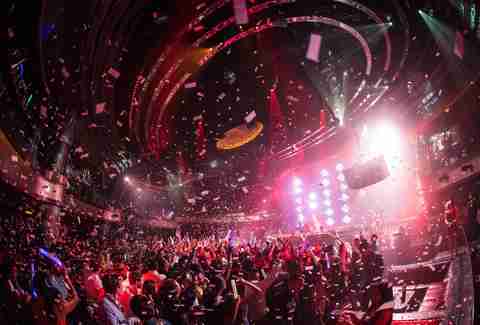 Why you'll also want to party here: The special effects are designed to overwhelm the senses, including a massive floor-to-ceiling LED screen behind the DJ booth. The music you'll be dancing to: Top 40 music designed for bachelorette parties on the prowl and guys looking to get lucky. Shaq has played a DJ set here at least twice. Yes, that Shaq. Why you'll also want to party here: The dance floor and bar are a bit no-frills, but the rooftop patio is phenomenal, nestled under the Paris casino's replica of the Eiffel Tower and an open-air view of Las Vegas Blvd two stories below. Rob Kachelriess is a former television news producer who has been writing about Las Vegas in Thrillist for more than three years. He was Managing Editor for Vegas2LA Magazine and his work has recently appeared in Vegas Seven and Vegas Magazine. He is wondering if he should have been a DJ instead of a writer. Follow him on Twitter @rkachelriess.